SMi’s ADC conference will be bringing a global presence from Pfizer, Genentech, Ablynx, Spirogen, Seattle Genetics, Medimmune, Antikor Biopharma, Heidelberg Pharma and more. 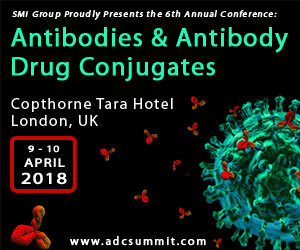 With an agenda full of exciting and new approaches, examine the latest developments in antibodies and antibody drug conjugates, including drug design, PK-PD and technological advancements, warheads and site selectivity, highly potent ingredients and immune-oncological combination therapies. Have your say and your questions answered during our two sessions presented by Janssen and Antikor Biopharma Ltd. Successful clinical translation of antibody-drug conjugates (ADCs) can be challenging due to complex pharmacokinetics and differences between preclinical and clinical tumors. Janssen will examine applications of modeling and simulation in order to overcome some of these challenges, such as the preclinical to clinical translation; the cytotoxic drug molecules creating the bystander effect. The barriers at certain ADC binding sites will also be investigated, along with cell-level pharmacokinetics of ADCs. – Presented to you by: Mahendra Deonarain, Chief Scientific and Operating Officer, Antikor Biopharma Ltd.